You are here: Home / Before and After Photos / We helped BWLW Member Myya Mixon get into People Magazine! 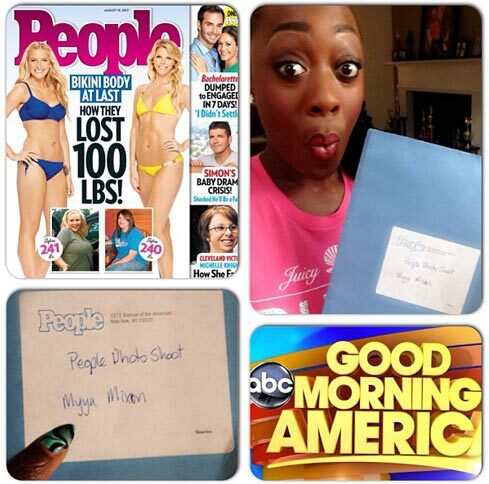 We helped BWLW Member Myya Mixon get into People Magazine! Myya we are so happy for you! Amazing! Make sure that watch Good Morning America tomorrow at 8am and that you pick up the August Issue of People Magazine (in stores now) and check out Myya’s photos. Let’s support our BWLW sista!! If you’d like to submit your story to be shared on our blog and Facebook page, here are the details. I think this is wonderful news because it shows that we as black women are really health conscious. It’s a side that media never shows and her article in People will definitely enlighten and empower the mass media that we are truly health conscious… way to go BWLW!